Oh boy, do I have some tackling to do today. Remember those dishes I mentioned yesterday?....well, here's my line of excuses for why they weren't done. School work all through the day yesterday, plus the usual heavy load of cleaning all through the house that we have to do on Monday's after the house has been tore-up on the weekend. I had to fit in 30 minutes of exercise late in the afternoon, and then my son had piano practice at 5:30. My husband was late at work and still wasn't home by the time we got out of piano, which was around 7:00 this time because of the explanations on the new books I mentioned we were getting. So, my husband called and said to have us meet him at Burger King (which I just hate feeding my kids) and we could eat there while we waited for him. I couldn't go home, because I needed my hubby to take money out of his checking account and give it to me to put in our joint account through the ATM, so that I would have the money to cover the check for the books I just purchased! Are you exhausted yet? I am, just recalling these events! So he eventually made it, and had a Whopper Jr. which I know didn't even put a dent in his hunger since he worked such a long hard day. Then we went and did the ATM shuffle, put gas in his work van and made it home a little after 8:00pm. He wasn't feeling well, and just wanted me to sit with him and watch a show or two before bed. I concentrated really hard on getting the dishes done while we watched t.v., but when I walked through the kitchen to go to bed, I looked at the counters, and.......nope, they didn't do themselves. So, that is why they are still there this morning, and I HAVE TO tackle them today! 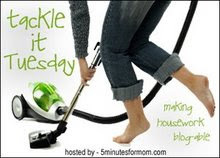 For more Tackle It Tuesday posts, head over to 5 Minutes For Mom! I'm happy to hear that you chose to sit with your husband and let the dishes wait. Sometimes that is hard for me because I keep a running mental list of all that needs to be done, and I feel anxious until it is all done. I'm working on it because.. well, it isn't healthy and I want to be in the moment with my family more. I hope that you get sometime to just relax today!